This is the last part of a four part interview with Chris Reed of Reed's Inc. Be sure to start reading with part 1. This section focuses on Chris himself. Chris Reed in the early days of Reed's. Do you eat ginger with every meal? I wouldn’t say that. I do lean towards ginger. Let me think of a meal I don’t put ginger in. I don’t think I’d do lasagna with ginger. But, it’s amazing how much Italian I do with ginger, with garlic and olive oil. Yes, I’d say there aren’t many meals where I wouldn’t use ginger. I consume ginger. I have these ginger candies (peanut butter ginger chews) - they’re around the office and everybody’s completely addicted to them. As a matter of fact, we ban them from the office four days a week because we’re eating too many of them. I eat better than the average recommended daily dose of ginger. I think that’s fair to say. Are you equally excited about the non-ginger beverages that you sell? Well, I’m a ginger freak. I love designing and I love the specialty packaging that we are going into like the Grolsch swinglette style and the big party kegs. I like being innovative in coming up with solutions to get things to market that are unique - not just the drinks, but the packaging. We just hit the top 100 beverage companies in America (put out by the beverage industry), which is very exciting. I’m excited by growing a business. It’s not all about ginger. Probably about 50 percent of what we do is about root beer. People love it so much. It makes me happy that it makes someone happy. But, don’t expect me to weigh in on the root beer. I honor the recipes that were given to me, and I just don’t mess with the formula. But, it’s really kind of fun to come up with the cream sodas, the black cherry cream, and the new cola. I had a lot of fun developing products for the Virgil’s line. Which beverage do you reach for when you want a drink? Well, I do mix it up. I have the baby ginger brews. The Extras in the seven ounce bottles are a really good size for me. They’re short, sweet, and not as many calories as a full twelve ounce bottle. Sometimes, when I’m partying (like at my birthday party), I’ll pull out the spiced apple brew and make some vanilla ice cream and spiced apple brew floats, which are killer! The root beer is good. But, our diets with the stevia sweetened products have only six calories in twelve ounces and they taste as good as the full sweetened version, in my mind. The black cherry cream with the stevia sweetener is just amazing. I think it tastes better than the sugar version. If you were going to interview one person about food, who would you interview? Wow. I’m so in my world. You’re pulling me out of my world. I might interview Jim Koch with Boston Beer. He’s kind of doing to beer what we are doing with sodas. I don’t drink much beer - that’s why I created my products. 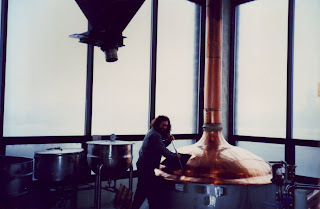 But, I have huge affinity to beer making. I was told by a psychic that I was a German brewmaster in a past life. I kind of believe it, because when I walk into a brewery, I like the smells going into the hops room and sticking my face in the hops - this is like heaven for me. But, in this life, I’m doing non-alcoholic. Jim Koch has done a fantastic job with Sam Adams beer and they’re the largest micro-brewery in the U.S. They’re definitely a boutique beer company. I would love to sit and interview him and find out how he did it, and what advice he’d have for me, stuff like that. And, Ben and Jerry’s. I’d love to talk with those guys. I talked to Jerry: “Jerry, when the hell are you going to do a ginger ice cream?" And he goes, “Well, it’s not popular enough.” I said, “You so do not understand it. It will be loved. People will have to come to your store for it and you’ll create it. People do love ginger. They just don’t know it.” In 1776, the number one flavor in America was ginger. The number one candy in America at the time of our revolution was ginger candy! A thoroughly enlightening read! Thank you for your continued hard work, Stef.